Enhance management independence and transparency by performing auditing functions for the company's business, as well as overall accounting and duties performed by executives. 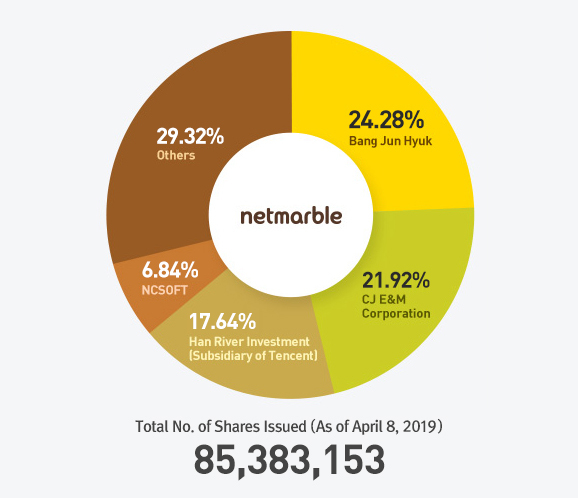 (1) The name of this company shall be “Netmarble Chusik Hoesa” (the “Company”), which shall be “Netmarble Corporation” in English and simply Netmarble as abbreviation. (5) Businesses incidental to subparagraphs (1) to (4) above. (1) The Company shall have its head office in Seoul. (2) The Company may establish branches, liaison offices, representative offices or local subsidiaries within or outside Korea by resolutions of the Board of Directors, when it deems necessary. Public notices of the Company shall be made in its website (http://company.netmarble.com); provided, however, that if such public notice in its website cannot be made for an unavoidable reason, the Company may make a public notice in “Hankook Kyongje Shinmoon,” a daily newspaper published in Seoul. The total number of shares to be issued by the Company shall be 200,000,000 shares. The par value per share to be issued by the Company shall be one hundred (100) Won. The Company shall issue 100,000 shares at the time of its incorporation. The shares to be issued by the Company shall be common shares in registered form. This company shall register the rights to be marked in the stocks and certificate of preemptive right to new stocks of electronic registration account book of the electronic registration institution instead of issuing stock certificates and certificate of preemptive right to new stocks. 3. By granting large numbers of unspecified persons (including the shareholders of the Company) an opportunity to subscribe for new shares to be issued by the Company, in a manner other than is set forth in subparagraph 1 above, to the extent not exceeding 30% of the total issued and outstanding shares of the Company, and allocating new shares to those of such persons who so subscribe. 4. Granting certain types of persons an opportunity to subscribe for new shares to be issued by the Company, in accordance with reasonable standards set forth in applicable laws, such as demand forecasts prepared by an investment trader or investment broker as underwriter or arranger. 5. In case of issuing new stocks according to the issuance of depositary receipts(DR) with the resolution of the board of directors by the provisions of the related legislation like Capital Market and Financial Investment Services Act. (3) In allocating new shares to persons other than the existing shareholders of the Company under subparagraph 2 of Paragraph (1) above, the Company shall give an individual notice to the shareholders or make a public notice, of the matters set forth in subparagraphs 1, 2, 2-2, 3 and 4 of Articles 416 of the Commercial Code, at least two (2) weeks prior to the due date for payment of subscription price for the new shares; provided, however, that in lieu of such individual notice or public notice, a report of material matters may be publicly disclosed to the Financial Services Commission and the Korea Exchange. (4) In the event of issuance of new shares by any of methods set forth in Paragraph (1) above, the type and number of shares to be issued and the issue price shall be determined by a resolution of the Board of Directors. (5) If the allocated new shares are not subscribed or paid for by the specific date, such shares shall be disposed of by a resolution of the Board of Directors with, taking into account the appropriateness of the issue price and other matters set forth in the relevant laws. (6) Fractional shares, if any, resulting from the allocation of new shares shall be disposed of by a resolution of the Board of Directors. In case the Company issues new shares through a rights offering, bonus issue or stock dividend, the new shares shall, for purposes of distribution of dividends on such new shares, be deemed to have been issued at the end of the fiscal year immediately prior to the fiscal year in which the new shares are issued. (1) The Company may grant stock options by a special resolution of the General Meeting of Shareholders, to the extent not exceeding 5% of the total number of issued and outstanding shares of the Company; provided, however, that by a resolution of the Board of Directors, stock options may be granted to persons other than Directors of the Company, to the extent not exceeding three (3) % of the total number of issued and outstanding shares. Any stock options granted by a resolution of the Board of Directors shall be approved in the first General Meeting of Shareholders convened after such grant. Stock options granted by a resolution of the General Meeting of Shareholders or a resolution of the Board of Directors may be a performance-tied type based upon management performance targets or market index. (2) The persons who are entitled to receive stock options shall be persons who have contributed, or are capable of contributing, to the establishment, management, technological innovations or the like of the Company. (3) The shares to be issued upon the exercise of a stock option (in case the Company pays the difference between the exercise price of stock options and the appraised value of such shares in cash or treasury shares, the shares which shall be the basis of the calculation of such difference) shall be common shares in registered form. 2. In the case of transfer of treasury shares, the price of the relevant stock appraised as of the date of granting stock options. 5. When there occurs any other event for cancellation of the stock option pursuant to the stock option agreement. 3. Deliver treasury shares which shall be common shares in registered form, at the exercise price of stock options. (7) A person who is granted stock options may only exercise such stock options if such person has served the Company for two (2) or more years following the date of the resolution of the General Meeting of Shareholders as provided in Paragraph (1) above (the “Stock Option Resolution Date”). Such person may exercise the stock options during the exercise period set forth in the relevant stock option agreement between such person and the Company, which period shall fall within five (5) years from the date on which such person has served the Company for two (2) or more years following the Stock Option Resolution Date; provided, however, that such person may exercise the stock options during the exercise period thereof even if, within two (2) years following the Stock Option Resolution Date, such person dies or resigns for reasons not attributable to such person. (8) With respect to the dividend on the new shares issued by exercise of stock options, the provisions of Article 10-2 hereof shall apply mutatis mutandis. (1) The Company shall have a transfer agent for its shares. (2) The transfer agent, its office and the scope of its duties shall be determined by a resolution of the Board of Directors. (3) The company shall furnish the list of stockholders and the copy of this company in the office handling place and render the title transfer proxy to deal with the electronic registration of stocks, the management of the list of stockholders, or other office as to stocks. (4) The relevant procedures for the activities referred to in Paragraph (3) above shall be carried out in accordance with the Regulation on the Securities Transfer Agency Business and other regulations applicable to transfer agents. (1) The Company shall, from the 1st day to the 15th day of January of each calendar year, suspend entries of alteration in the shareholders' registry, registration of the creation and cancellation of pledges over shares, and indication of trust assets and cancellation thereof with respect to shares. (2) The Company shall cause the shareholders registered in the shareholders' registry as of the last day of each fiscal year to exercise the rights as shareholders in the General Meeting of Shareholders convened for such fiscal year. (3) If necessary for convening of an Extraordinary General Meeting of Shareholders or any other necessary cases, the Company may, by a resolution of the Board of Directors, suspend any entry into the shareholders' registry with respect to shareholders' rights for a period not exceeding three (3) months, or cause the shareholders whose names appear in the shareholders' registry on a record date set by a resolution of the Board of Directors to exercise the rights as shareholders; provided that at least two (2) weeks prior notice shall be given to the public. If the Board of Directors deems it necessary, the Company may suspend any entry into the shareholders' registry and set the record date at the same time. (1) The Company may issue bonds by a resolution of the Board of Directors. (2) Notwithstanding Paragraph (1) above, the Board of Directors may delegate to the Chief Executive Officer the issuance of bonds within a period not exceeding one (1) year, by designating the amount and types of the bonds to be issued. 2. If, by a method other than that specified in subparagraph 1 of Article 10(1) above, the Company issues convertible bonds, to the extent that the total par value of the bonds shall not exceed KRW 500 billion, by granting large numbers of unspecified persons (including the shareholders of the Company) an opportunity to subscribe for bonds to be issued by the Company and allocating convertible bonds to those of such persons who so subscribe. 3. Granting certain types of persons an opportunity to subscribe for convertible bonds to be issued by the Company, in accordance with reasonable standards set forth in applicable laws, such as demand forecasts prepared by an investment trader or investment broker as underwriter or arranger. (3) The Board of Directors may cause the convertible bonds referred to in Paragraph (1) above to be issued on the condition that conversion rights will be attached to only a portion of the convertible bonds. (4) The shares to be issued upon conversion shall be common shares in registered form, and the conversion price, which shall be equal to or more than the par value of the shares, shall be determined by the Board of Directors at the time of issuance of the convertible bonds. (5) The conversion period shall commence on the date on which one (1) month has passed since the issue date of the convertible bonds and end on the date immediately preceding the redemption date thereof. However, the conversion period may be adjusted within the above period by a resolution of the Board of Directors. (6) For the purpose of any distribution of dividends on the shares issued upon conversion, and any payment of accrued interest on the convertible bonds, Article 10-2 hereof shall apply mutatis mutandis. (7) The minimum conversion price as adjusted after a market price decrease may, by a special resolution of the General Meeting of Shareholders, be determined by the Company at a level lower than 70% of the conversion price in effect as of the issuance of the convertible bonds. 2. If, by a method other than that specified in subparagraph 1 of Article 10(1) above, the Company issues bonds with warrants, to the extent that the total par value of the bonds shall not exceed KRW 500 billion, by granting large numbers of unspecified persons an opportunity to subscribe for bonds to be issued by the Company and allocating bonds with warrants to those of such persons who so subscribe. 3. Granting certain types of persons an opportunity to subscribe for bonds with warrants to be issued by the Company, in accordance with reasonable standards set forth in applicable laws, such as demand forecasts prepared by an investment trader or investment broker as underwriter or arranger. (3) The amount of new shares which can be subscribed for by the holders of the bonds with warrants shall be determined by the Board of Directors, to the extent that the amount of such new shares shall not exceed the total par value of the bonds with warrants. (4) The shares to be issued upon exercise of warrants shall be common shares in registered form, and the issue price, which shall be equal to or more than the par value of the shares, shall be determined by the Board of Directors at the time of issuance of bonds with warrants. (5) The period during which the warrants may be exercised shall commence on the date on which one (1) month has passed since the issue date of the bonds with warrants and end on the date immediately preceding the redemption date thereof. However, the period during which the warrants may be exercised may be adjusted within the above period by a resolution of the Board of Directors. (6) For the purpose of any distribution of dividends on the shares issued upon exercise of warrants, Article 10-2 hereof shall apply mutatis mutandis. (7) The minimum warrant exercise price as adjusted after a market price decrease may, by a special resolution of the General Meeting of Shareholders, be determined by the Company at a level lower than 70% of the warrant exercise price in effect as of the issuance of the bonds with warrants. This company shall register the rights to be marked in the debentures and policy of preemptive right to new stocks of electronic registration account book of the electronic registration institution instead of issuing debentures and policy of preemptive right to new stocks. The provisions of Articles 11 hereof shall apply to the issuance of bonds mutatis mutandis. (1) General Meetings of Shareholders of the Company shall be of two types: (i) Ordinary and (ii) Extraordinary. (2) The Ordinary General Meeting of Shareholders shall be held within three (3) months after the end of each fiscal year and the Extraordinary General Meeting of Shareholders may be convened whenever deemed necessary. (1) The Chief Executive Officer of the Company or other person designated by the Board of Directors, if any, shall convene the General Meeting of Shareholders in accordance with a resolution of the Board of Directors, unless otherwise prescribed by the applicable laws and regulations. (2) If the Chief Executive Officer is absent or unable to perform his/her duties, Article 34(2) below shall apply mutatis mutandis. (1) A convocation notice of the General Meeting of Shareholders of the Company stating the date, time and place of the Meeting and the purposes for which the Meeting has been convened shall be sent, in writing or in electronic form, to all shareholders at least two (2) weeks prior to the date set for such Meeting. (2) A convocation notice of the General Meeting of Shareholders to the shareholders holding shares one-hundredth (1/100) or less of the total number of voting shares of the Company may be deemed to be made under Paragraph (1) above by (i) inserting two (2) or more public notices in Hankook Kyongje Shinmoon and Maeil Kyongje Shinmoon circulated in Seoul, or (ii) making a public notice on the Data Analysis, Retrieval and Transfer System operated by the Financial Supervisory Service or the Korea Exchange. The General Meeting of Shareholders shall be held in the city where the head office of the Company is located or any other place adjacent thereto as necessary. (1) The Chief Executive Officer shall be the Chairman of the General Meetings of Shareholders. (2) If the Chief Executive Officer is absent or unable to perform his/her duties, the Chairman shall be appointed by a resolution of the Board of Directors. (1) The Chairman of the General Meeting of Shareholders may order persons who purposely speaks or acts in a manner that prevents or disrupts the deliberations of the General Meeting of Shareholders or who otherwise disturb the public order of the General Meeting of Shareholders to stop their remarks or to leave the place of meeting. The persons so ordered shall comply with the order. (2) The Chairman may restrict the length and frequency of the speech of shareholders if it is necessary for the smooth deliberations of the General Meeting of Shareholders. Each shareholder shall have one (1) vote for each share he/she/it owns. If the Company, its parent company or any of its subsidiaries, alone or in aggregate, hold shares exceeding ten (10) % of the total number of issued and outstanding shares of another company, the shares of the Company held by such other company shall not have voting rights. (1) If any shareholder who holds two (2) or more votes wishes to split his/her/its votes, he/she/it shall notify the Company, in writing or in electronic document, of such intent and the reasons therefor no later than three (3) days prior to the date set for the General Meeting of Shareholders. (2) The Company may refuse to allow the shareholder to split his/her/its votes, unless the shareholder acquired the shares in trust or otherwise holds the shares for and on behalf of some other person. (1) A shareholder may exercise his/her/its vote through a proxy. (2) A proxy holder under Paragraph (1) above shall file with the Company documents (power of attorney) evidencing the authority to act as a proxy prior to the commencement of the General Meeting of Shareholders. Except as otherwise provided in the applicable laws and regulations, all resolutions of the General Meeting of Shareholders shall be adopted by the affirmative vote of a majority of the shareholders present; provided that such votes shall, in any event, represent not less than one-fourth (1/4) of the total number of issued and outstanding shares of the Company. The substance of the course of the proceedings of the General Meeting of Shareholders and the results thereof shall be recorded in the minutes and such minutes shall be kept at the head office and branches of the Company. The directors of this company shall be 5 persons. (1) The Directors shall be elected at the General Meeting of Shareholders. (2) In electing two or more Directors, the cumulative voting as prescribed by Article 382-2 of the Commercial Act shall not apply. (1) Candidates for outside Directors shall be recommended by the Outside Director Candidate Recommendation Committee from among persons meeting the qualification requirements under the Commercial Code and other relevant laws. (2) Detailed matters regarding the recommendation of candidates for outside Directors and examination of their qualifications shall be determined by the Outside Director Candidate Recommendation Committee. The term of office for the Director shall be until the close of the Ordinary General Meeting of Shareholders convened in respect of the 3rd fiscal year after the date of appointment of such Director. (1) In the event of any interim vacancy in the office of any Director, a substitute Director shall be elected in a General Meeting of Shareholders; provided, however, that the foregoing shall not apply if the number of the remaining Directors satisfies the required number of Directors and such vacancy does not cause any difficulties in the business operation of the Company. (2) If, due to the resignation or death of an outside Director or a similar cause, the required number of Directors under Article 29 above is not satisfied, such required number shall be satisfied in the first General Meeting of Shareholders convened after the occurrence of such cause. (1) The Company shall have the Executive Officer(s). The number, titles, remuneration, etc. of the Executive Officer(s) shall be determined by a resolution of the Board of Directors. (2) The Executive Officer(s) of the Company shall be appointed by a resolution of the Board of Directors. (3) If there is one (1) Executive Officer, the Executive Officer shall be the Chief Executive Officer and if there are two (2) or more Executive Officers, the Chief Executive Officer shall be appointed by a resolution of the Board of Directors. (4) The term of office of the Chief Executive Officer and the Executive Officer(s) shall expire at the close of the first meeting of the Board of Directors to be held immediately after the Ordinary General Meeting of Shareholders convened for the final fiscal year [two (2)] years after of his or her assumption of the office. (1) The Chief Executive Officer shall represent the Company and take overall charge of the business operation of the Company. (2) The Executive Officer(s) shall assist the Chief Executive Officer and perform their respective duties. (3) The Chief Executive Officer and the Executive Officer(s) of the Company shall report the status of their respective business performance to the Board of Directors at least once every three (3) months. (4) The Chief Executive Officer and the Executive Officer(s) may request a person, who is entitled to convene a meeting of the Board of Directors, the convening of the meeting by submitting to the person, documents stating the agenda and reasons for convening such meeting. A Director shall be released from his or her liability as Director or Executive Officer(s) under Article 399 or 408-8 of the Commercial Code with respect to the portion of such liability which exceeds six (6) times (or three (3) times in the case of an outside Director) the amount of his or her remuneration (which shall include any bonus and profit arising from his or her exercise of stock options) during the one year immediately prior to the date of the Director’s or Executive Officer’s action which caused such liability, except where the Director or Executive Officer(s) has caused damage by willful misconduct or gross negligence or falls under Articles 397, 397-2, 398 and 408-9 of the Commercial Code. If any Director or Executive Officer(s) finds any fact which may cause substantial damage to the Company, such Director or Executive Officer(s) shall promptly report such to the Audit Committee. The Board of Directors shall consist of Directors and resolve important matters regarding the business affairs of the Company as set forth in the applicable laws and regulations, these Articles of Incorporation or the Board of Directors Regulations. (1) The Chairman of the Board of Directors shall be elected by the Board of Directors from among the Directors. (2) If the Chairman is absent or unable to perform his/her duties, the chairmanship shall be performed by other persons in the order of priority determined by the Board of Directors. (1) A meeting of the Board of Directors shall be convened by the Chairman of the Board of Directors, who shall give each Director a written or oral notice of such meeting at least five (5) business days prior to the date set for such meeting; provided, however, that such convocation procedure may be omitted with the unanimous consent of all Directors. (2) Each Director may request the Chairman of the Board of Directors to convene a meeting of the Board of Directors, if deemed necessary for the performance of duties as Director. In such case, the Chairman of the Board of Directors shall immediately convene a Board of Directors meeting pursuant to Paragraph (1) above. (1) Except as otherwise provided in the applicable laws and regulations or these Articles of Incorporation, all resolutions of a Board of Directors meeting shall be adopted by the affirmative vote of more than one-half (1/2) of the Directors present at such meeting where more than one-half (1/2) of the total number of Directors are present. (2) Any Director who has a particular interest in the matters to be resolved at a meeting of the Board of Directors shall not be entitled to vote at such meeting. (3) The Board of Directors may allow all or part of the Directors to participate, without being actually present at a Board of Directors meeting, in the resolution of such Board of Directors’ meeting, by means of a communication system whereby they may receive and transmit live audio communications. Directors participating in a Board of Directors meeting in such manner shall be deemed to be present in person at such meeting. No Director may be engaged in the same kind of business activities as the Company, without the approval of the Board of Directors. The agenda, proceedings and results of any Board of Directors meeting shall be recorded in the minutes, which shall be affixed with the names and seal impressions or signatures of the Chairman and the Directors present thereat. 4. Other committees as deemed necessary by the Board of Directors. (2) The composition, powers, operation, etc. of each of the committees within the Board of Directors shall be determined by a resolution of the Board of Directors. (3) The provisions of Articles 36, 37 and 39 hereof shall apply mutatis mutandis with respect to committees within the Board of Directors. (1) The Company shall have an Audit Committee under Article 39-2 hereof (the “Audit Committee”) in lieu of statutory auditors. (2) The Audit Committee shall consist of three (3) or more Directors. (3) Two-thirds (2/3) or more of the members of the Audit Committee shall be outside Directors, and the requirements under Article 542-10(2) of the Commercial Code shall be satisfied with respect to any member of the Audit Committee who is not an outside Director. (4) In electing Audit Committee members who are outside Directors, any shareholder who holds voting shares more than three-one hundredth (3/100) of the total voting shares of the Company may not exercise his/her voting rights with respect to such excess shares. (5) In electing or dismissing Audit Committee members who are not outside Directors, the largest shareholder may not exercise voting rights with respect to such portion of the sum of (i) the shares held by the largest shareholder and his or her specially related persons, (ii) the shares held on account of such largest shareholder and his/her specially related persons, and (iii) the shares of which the voting rights have been delegated to such largest shareholder or his/her specially related persons, as may exceed three (3)% of the total voting shares of the Company. (6) The Audit Committee shall, by its resolution, select a person (chairman) who will represent the Audit Committee, and such chairman shall be an outside Director. (7) If the number of outside directors owing to the reason of the resignation, death etc. of the outside directors who are the committee of Audit Committee falls short of the composition requirements of Audit Committee specified in this Article, the company shall conform to the requirement in the general meeting of stockholders convened first after the reason occurs. (1) The Audit Committee shall examine the operation and accounting of the Company. (2) The Audit Committee may, if necessary, request the convening of a meeting of the Board of Directors by submitting, to a Director (or a person, if any, who has the authority to convene a Board of Directors meeting; same hereinafter), documents stating the agenda and reasons for convening such meeting. (3) If, despite the request under Paragraph (2) above, a Board of Directors meeting is not promptly convened by the relevant Director, the Audit Committee that made such request may convene a Board of Directors meeting. (4) The Audit Committee may request the Board of Directors to convene an Extraordinary General Meeting of Shareholders by submitting documents stating the agenda and reasons for convening such meeting. (5) The Audit Committee may request business reports from any subsidiary of the Company if it is necessary for performing his or her duties. In this case, if such subsidiary does not report to the Audit Committee immediately or the Audit Committee needs to verify the content of such report, the Audit Committee may investigate the status of business and financial condition of such subsidiary. (6) The Audit Committee shall appoint external auditors. (7) In addition to the matters referred to in Paragraphs (1) through (6) above, the Audit Committee shall carry out the matters delegated by the Board of Directors. (8) No matters resolved by the Audit Committee may be resolved again by the Board of Directors. (9) The Audit Committee may, at the expenses of the Company, seek the assistance of experts. For the audit performed by the Audit Committee, the Audit Committee shall prepare an auditor’s record, which shall record the substance and results of the audit and shall be affixed with the names and seal impressions or signatures of the Audit Committee members who have performed such audit. (1) The remuneration for the Directors shall be determined by a resolution of the General Meeting of Shareholders. (2) The payment of severance pay for the Directors shall be in accordance with the “Regulations on Severance Pay for Officers”, which has been approved at the General Meeting of Shareholders. (1) The Chief Executive Officer of the Company shall prepare the documents set forth in Articles 447 and 447-2 of the Commercial Code, which shall be approved by the Board of Directors. (2) The Chief Executive Officer shall submit the documents set forth in Paragraph (1) above to the Audit Committee no later than six (6) weeks prior to the date of the Ordinary General Meeting of Shareholders. (3) The Audit Committee shall submit an audit report to the Chief Executive Officer at least one (1) week prior to the date of the Ordinary General Meeting of Shareholders. (4) The Chief Executive Officer shall keep on file the documents described in Paragraph (1) above, together with an audit report thereon, at the head office of the Company for five (5) years, and certified copies thereof at the branches of the Company for three (3) years, beginning from one (1) week prior to the date of the Ordinary General Meeting of Shareholders. (5) The Chief Executive Officer shall submit the documents set forth in Article 447 of the Commercial Code to the Ordinary General Meeting of Shareholders for approval and submit and report the documents set forth in Article 447-2 of the Commercial Code to the Ordinary General Meeting of Shareholders. (6) Notwithstanding Paragraph (5) above, the Company may approve the documents set forth in Article 447 of the Commercial Code, by a resolution of the Board of Directors, if (i) the external auditor gives the opinion that the documents set forth in Article 447 of the Commercial Code appropriately present the financial position and management performance of the Company pursuant to the applicable laws and regulations and these Articles of Incorporation and (ii) all of the members of the Audit Committee agree. (7) In the event the Board of Directors has approved the above documents in accordance with Paragraph (6) above, the Chief Executive Officer shall report the terms of each of the documents to the General Meeting of Shareholders. (8) Immediately upon obtaining the approval under Paragraphs (5) or (6) above, the Chief Executive Officer shall make a public notice of the balance sheet and audit opinion of the external auditor. The Company shall appoint the outside auditor selected by Audit Committee according to the provisions of Act on External Audit of Corporation, and report the fact to a regular general meeting of stockholders convened during the business year of the appointment or notify or announce it to the stockholders according to the decision in the Act on External Audit of Corporation Enforcement Ordinance. 5. other appropriation of earned surplus. (1) Dividends may be distributed in cash or stock. (2) This company may allocate quarterly dividend with the money to the stockholders on the ending date of March, June and September by the resolution of Board Meeting and the payment of the dividend shall be executed within 45 days from the date of above resolution. (3) The dividend of Clause 1 and Clause 2 shall be paid to the stockholder or the registered pledge entered in the list of stockholders as of each settlement date or quarterly dividend reference date. (4) In case the company has issued new stocks prior to the standard date after the commencement date of the business year(including capital transfer of reserve, stock dividend, request of conversion of convertible debentures or the execution of acceptance rights of new stocks of the preemptive debentures in warranty), the new stocks in quarterly dividend shall have been issued at the end of the previous business year. (5) The company shall not pay the interest as to the stockholder's dividend. (1) The right to demand payment of dividends shall extinguish by prescription unless exercised within five (5) years. (2) The dividends of which the right has been extinguished under Paragraph (1) above shall be kept by the Company. The Company shall be established through a spin-off of CJ E&M Corporation, and these Articles of Incorporation shall become effective from the date of incorporation of the Company. The initial fiscal year of the Company shall be until December 31 of 2011, notwithstanding the provisions of Article 45 above. These Articles of Incorporation shall become effective from March 28, 2013. These Articles of Incorporation shall become effective from March 21, 2014. These Articles of Incorporation shall become effective from June 30, 2014. These Articles of Incorporation shall become effective from August 26, 2014. These Articles of Incorporation shall become effective from March 27, 2015. These Articles of Incorporation shall become effective from September 23, 2016. These Articles of Incorporation shall become effective from October 31, 2016. These Articles of Incorporation shall become effective from March 30, 2018. These Articles of Incorporation shall be effective from March 29, 2019. However, the amended content of Article 9, Article 11, Article 14-2, Article 15 etc. shall be in the force and effect from Sept. 16, 2019 [The Enforcement Decree of the Act on the electronic registration of stocks, bonds, etc.] is executed.